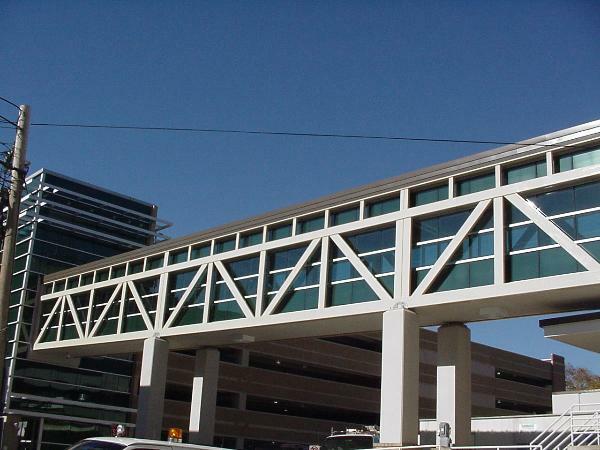 The Skywalk structure spans 135’ from a parking garage to an office building. The Skywalk provides pedestrian controlled path. 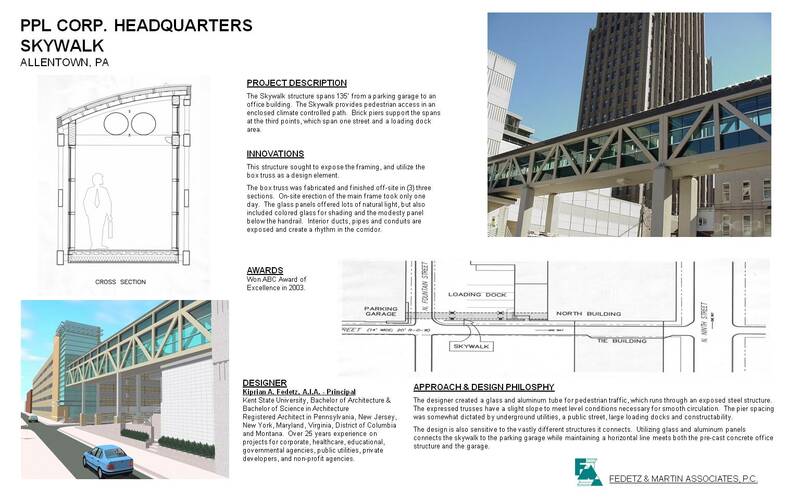 Brick piers support The Skywalk structure spans 135’ from the spans at the third points, which the spans at the third points, which span one street and a loading dock area. This structure sought to expose the framing, and utilize the box truss as a design element. The box truss was fabricated and finished off-site in (3) three sections. On-site erection of the main frame took only one day. The glass panels offered lots of natural light, but also included colored glass for shading and the modesty panel below the handrail. Interior ducts, pipes and conduits are exposed and create a rhythm in the corridor. Won ABC Award of Excellence in 2003. A multiple span bridge in a park setting. 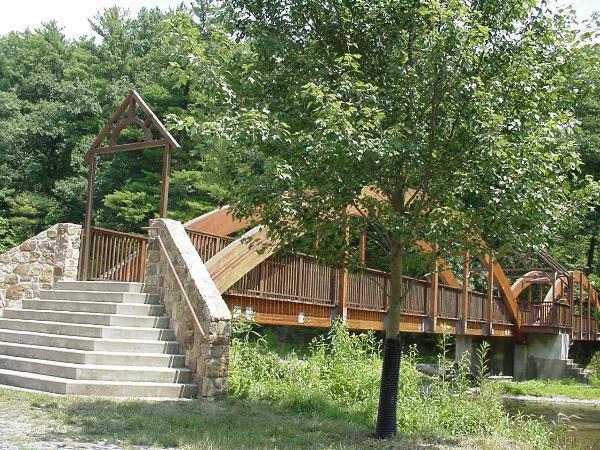 The bridge links a picnic area to a nature trail. Each span is 90’ with an existing concrete abutment on an island in the middle of Jordon Creek. 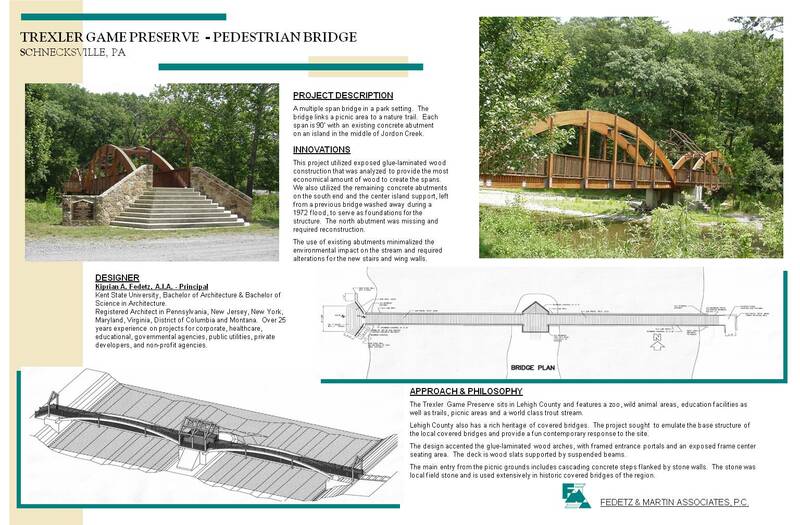 This project utilized exposed glue-laminated wood construction that was analyzed to provide the most economical amount of wood to create the spans. We also utilized the remaining concrete abutments on the south end and the center island support, left from a previous bridge washed away during a 1972 flood, to serve as foundations for the structure. The north abutment was missing and required reconstruction.The use of existing abutments minimalized the environmental impact on the stream and required alterations for the new stairs and wing walls.